This pair have a Fleegle heel too but it seems very wide compared to the previous ones. maybe something to do with the use of the Half Linen Stitch in the heel. 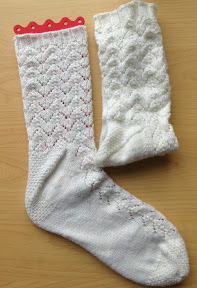 Anyway, they are a prototype for the next pair of socks I'm making for a new pal living in the Eastern States of USA.